Economy Grab Rails - Designed To Prevent Falls. 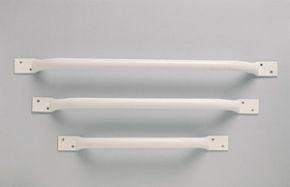 Plastic coated steel grab rails. Manufactured from 2.5cm (1”) tube. Two fixing holes with flat fixing plates. Excellent product and swift delivery. A 1st Class service. The item was delivered so quickly I wondered how it was done. Will not hesitate to use this outlet again. Good hand rail. Easy to fit. I feel safe holding onto it.